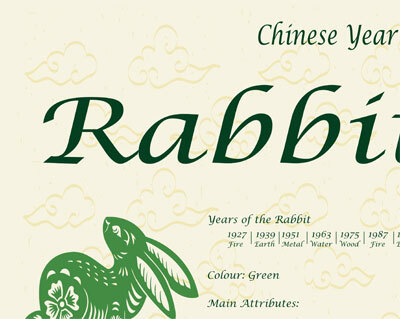 Years of the Rabbit: 1927 – 1939 – 1951 – 1963 – 1975 – 1987 – 1999 – 2011. Rabbits fall under a most fortunate sign! Their sign is the emblem of long life and they possess the powers of the moon. Rabbits are very sensitive to beauty. They are gracious and soft spoken. Rabbits are the diplomats and the peace-makers. They enjoy a tranquil life and love a quiet evening at home. Rabbits are reserved and very artistic. They are thorough and good scholars. When Rabbits are moody, which is often, they will appear totally indifferent to the world. 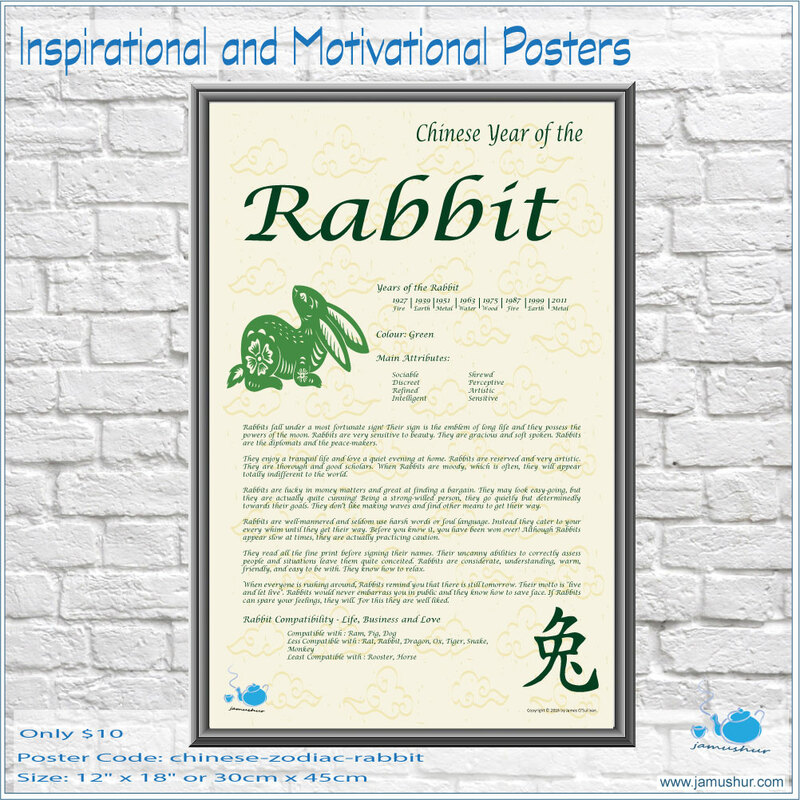 Rabbits are lucky in money matters and great at finding a bargain. They may look easy-going, but they are actually quite cunning! Being a strong-willed person, they go quietly but determinedly towards their goals. They don’t like making waves and find other means to get their way. Rabbits are well-mannered and seldom use harsh words or foul language. Instead they cater to your every whim until they get their way. Before you know it, you have been won over! Although Rabbits appear slow at times, they are actually practicing caution. They read all the fine print before signing their names. Their uncanny abilities to correctly assess people and situations leave them quite conceited. 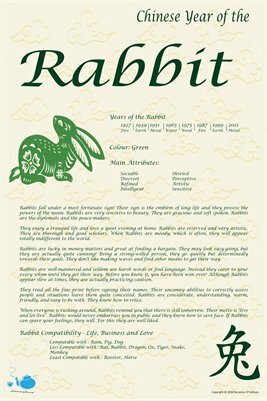 Rabbits are considerate, understanding, warm, friendly, and easy to be with. They know how to relax. When everyone is rushing around, Rabbits remind you that there is still tomorrow. Their motto is “live and let live”. Rabbits would never embarrass you in public and they know how to save face. If Rabbits can spare your feelings, they will. For this they are well liked.